We've had a couple of "Ewww, gross!" moments in the household this past weekend. As always with these things, this is my opinion of the product. Your mileage may vary. Any rebroadcast, reproduction, or other use of the pictures and accounts of this game without the express written consent of Major League Baseball is prohibited. Do not use in the shower. Void where prohibited. Some assembly required. Use AA batteries only. You know, all the disclaimer stuff. I'm the gal who loved Mandarin Chocolate Surprise, an orange flavored dark chocolate ice cream that Baskin Robbins had back in the early 1980's. I remember going to get a double scoop of it and having the clerk say, "Does this flavor really make you glow in the dark?" My tastes border on slightly weird. Anyway, our first "ewwww" is that wanna be Dr Pepper. Mr. Pibb is probably the ONLY soda of this ilk that comes close to my beloved Dr Pepper. I've had Dr. Thunder, WalMarts horrible attempt. Dr. Storm is beyond bad, beyond terrible, beyond horribad. I really don't have any words for how bad this is. At 88 cents for a 2 liter, compared to $1.89 for a 2 liter of Dr Pepper, it's hugely tempting to shave a lot off your grocery bill and buy this. Don't. Just don't. I think I consumed about an eighth of a cup and I just couldn't drink any more. I wound up pouring this down the drain. Now, I'm craving Dr Pepper. 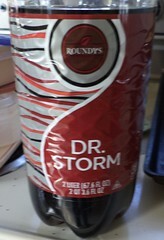 I shouldn't have bought the Dr. Storm in the first place but I wanted soda. I should have told the "I want" in my head that seltzer was just fine. Seltzer is just fine, but I'm down to my last 2 cans of that. These made the "ewww" list. Now, the girls love Temptations cat treats. These were in a box of stuff I won. (Memo to self: the box this came in needs to be recycled. It's in the way.) I got a drinking fountain, a bag of cat food, 6 cans of cat food and these treats. I thought, for a holiday treat, I'd open this up and see how the girls liked them. They were very excited when I ripped open the top of the package. They know treat bags by sight. I gave each of them 5 pieces. Mija sniffed hers and then looked at me as if to say, "This is all you got? No. No. I know the treats come in this bag. You're fooling me." She refused to eat them. 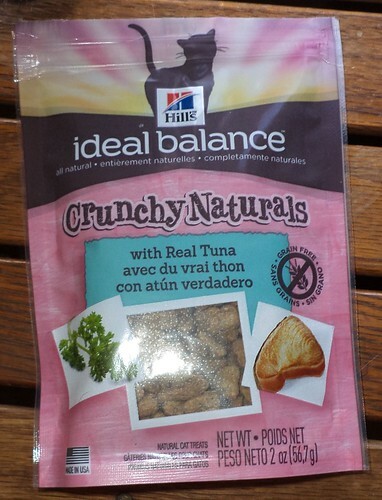 Pilchard sniffed them and actually tried them, but she didn't eat all that I gave her. In fact, she ate half of the 6 I gave her and then sat down with the rest at her feet. She just looked at me. It was "the look", the "I am disgusted" look. I know you're supposed to mix old with new when you're changing over to new food. But, with treats, it shouldn't really matter. Treats are treats. They get a couple before I head to work and a couple when I get home from work. Beyond that, they don't get any more. They have to like them out of the bag immediately, or it's not worth it. I tried again later in the day but got even less of a response to them. I sprinkled them about the deck where the raccoons could have them overnight. As they were gone in the morning, I'm assuming there were a hit with the wildlife. So, we've had a couple of big no's in the house. I need to find some "Yes's".